Soul of Appalachia: The Blue Ridge Music Trails encompasses hundreds of musical points of interest in 28 counties throughout Western North Carolina. From informal, back-room jam sessions to major festivals to centers of learning, a book and new website offer a guide to the region’s tuneful heritage. All across the Wilkes Community College campus in Wilkesboro, where the festival is held each April, spontaneous jam sessions are a common occurence. A Show of Talent: A highlight of the Blue Ridge Music Trails experience, MerleFest is a place where renowned musicians, including Shannon Whitworth and husband Woody Platt of the Steep Canyon Rangers mingle with the crowds. Pickers young and old, students and pros, gather ’round to jam. Dancing is part of the fun too. Points of Interest: Top, Whipporwill Village in Ferguson features a restored schoolhouse, store, smokehouse, and log cabin. Free performances by accomplished musicians, including mandolin player Herb Lambert take place most weekends. Dinner Date: Sims Country Bar-B-Que in Caldwell County advertises itself as being “centrally located in the middle of nowhere,” which is where the Blue Ridge Music Trails of North Carolina guidebook comes in handy. The restaurant serves an all-you-can-eat barbecue dinner followed by music and dancing on Fridays and Saturdays starting at 5 p.m. Listen & Learn Housed in the former Cleveland County Courthouse in Shelby and open Wednesday through Sunday, the new Earl Scruggs Center offers several galleries of exhibits, including one that illustrates the style of banjo finger picking for which the artist is famous. 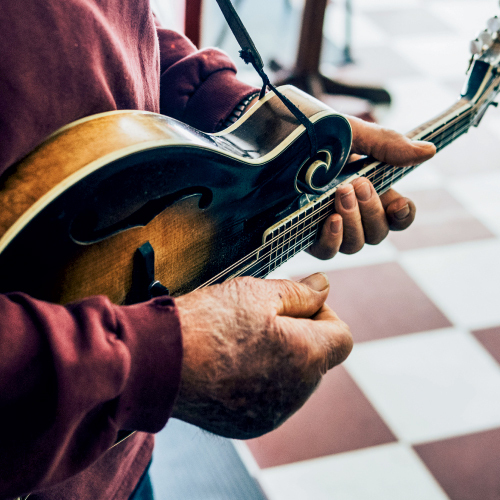 It’s the first stop on the first day of a long weekend touring mountain towns, and in the sweet spring air, the whole hollow is filled with strumming, picking, and singing. I once saw Doc Watson play live—and thought his rich, smooth voice was sent by angels—but this is my first Merle- Fest. My traveling partner and I agree that the event is as fine a place as any to kick off a self-guided tour of the Blue Ridge Music Trails, a network of history-laden locations, venues, and landmarks that celebrates mountain melodies, road-trip style. For this musical ramble, we’re using the namesake book as our guide. It’s early afternoon on a Friday at the annual gathering, and people of all ages are emptying from shuttle buses by the hundreds and striding in purposefully, with guitars, banjos, and folding chairs under their arms. I get the sense that most have been here before. It’s a lively but orderly scene—an alcohol-free gathering of pure music seekers donning plaid flannel, denim jeans, and cowboy boots and hats. “Do you know who that is? Me neither, but I think they’re famous,” I overhear a teenager saying to a friend. She’s pointing into the crowd, but I can’t tell who’s the subject of her attention: Music and musicians are everywhere this rainy afternoon. Clearly, the thing to do—besides eating barbecue turkey drumsticks or shopping for custom-made guitars in the vendor tents—is to wander through the views and sounds of a dozen open-air stages set across the Wilkes Community College campus in Wilkesboro until you find music you’d like to settle into awhile. On one rain-misted stage, Shannon Whitworth, a founding member of the Biscuit Burners and now a solo artist, is wearing a dress that’s as vivid green as spring clover. “You are my sunshine, my only sunshine.... Please don’t take my sunshine away,” she sings to close her set. And as she walks off stage to greet fans, the sun actually does start to push through the clouds. But then, Whitworth seems to have good luck at MerleFest, which has become like a homecoming for her and many of the thousands who attend each April. She explains that she first came to the festival as a student at Appalachian State University, and that one year, she successfully hid a puppy, Isis, in her raincoat and snuck the four-week-old fluff ball through the gates. On the afternoon we meet, Whitworth’s husband, Woody Platt of the Steep Canyon Rangers, is by her side. He’s the tall and handsome guitarist from Brevard whose Grammy-winning band often includes actor/ banjo player Steve Martin. Platt also has a long history with the festival, and he knows its importance on the music scene. “When you play here, you’ve hit the high water mark,” he contends. During the years he was just a spectator, he remembers when he and a friend once borrowed Whitworth’s truck to get to MerleFest—long before they were a couple. This year, between their respective sets on stage, the married pair could be seen walking off together across the campus, Platt carrying Whitworth’s banjo in one hand and holding her hand in the other. The next morning, I think again of Doc Watson, the flat-picking, Grammy-winning guitarist who grew up not far from Boone, in Deep Gap, and whose son is the namesake for MerleFest. (The festival was created after the younger Watson’s tragic death in a tractor accident in 1985.) Doc went on to play live shows until weeks before he died in 2012, at the age of 89. We drive over to the corner of Main and Depot streets in Boone and find the bronze statue of Watson in the dappled light under a tree. There he is, alright, seated with his guitar on a park bench. Mast General Store hasn’t yet opened for the day, so the sidewalk is sparse, but other admirers soon begin filing up to sit beside the likeness of the humble man who made such a lasting mark on American music, no matter that he’d lost his vision as a child. “Just one of the people,” is engraved on a plaque. I notice that visitors naturally put their arm around the metal figure for a photo. Meanwhile, Watson appears to still be strumming his guitar, blind eyes closed. It’s a beautiful sunny day, and we continue on into the Wilkes County countryside to look for signs of folk legend Tom Dula—or “Dooley,” as the Confederate veteran became known. Apparently enmeshed in a love triangle after the Civil War, Dula was hung from a tree for the murder of Laura Foster, a woman he’d been courting. Along the way, we’ve been listening to a recording of “Tom Dooley” by folklorists Anne and Frank Warner that’s part of the 26-song CD that accompanies the book, Blue Ridge Music Trails of North Carolina. We know we’re in the right place when we see a Tom Dula historic marker on a roadside bend along scenic N.C. 268 (Tom Dooley Road) in Ferguson. At a farm a mile away, the adult daughters of Edith and Hill Carter regularly open the property’s hilltop of historic buildings to the public. The Whippoorwill Village site includes a log cabin that houses a series of paintings by Edith Carter that depict the Tom Dooley story, along with LPs from the 1950s and ’60s versions of “Tom Dooley.” (Both Doc Watson and the Kingston Trio recorded popular renditions.) We stop in and learn even more details about the legend. Margaret Martine, one of the Carter daughters, points out a decades-old photo of the Kingston Trio visiting the farm, and she explains that their family connection to the Dooley legend includes being descendants of the doctor who performed an autopsy on Laura Foster. The legend and song become even more fascinating and real with each of these anecdotes. Evidently, a Dula gravestone is still in place nearby, but if we want to search for that relic, we’ll have to return to Wilkes County another day. Instead, we’re ready for more music, and drive south for an hour or so through Morganton, home of the Red, White and Bluegrass Festival each summer. Our destination is the two-block Main Street in nearby Drexel. Tracing its roots to 1949 and open for 50 years in the same corner building is the Drexel Barber Shop, known for its pick-up jam sessions that attract musicians, particularly on Saturdays. Trim and tall with fluffy, white hair, David Shirley is standing at the barber chair with his scissors when we walk inside. About a dozen people have already gathered in the “Back Room” or are sitting near the barber’s chair in the “Talkin’ Room.” (The room titles are painted right onto the doors.) I take in the scene of checkerboard tile floor, old guitars, and framed pictures of musicians and the beloved founding owner, Lawrence Anthony, a World War II veteran who passed away in 2009. As the crowd grows one by one, Shirley points out a violinist who, he says, has played in Dolly Parton’s band, and he introduces Herb Lambert, 87, who brought his mandolin and tells me he was born within a few miles of the shop. I ask about the mandolin, and Lambert recalls how he was part of the Blue River Boys bluegrass band that played venues across the country in the 1970s and ’80s, once getting a rave review in The New York Times after a concert at the Lincoln Center. He lifts the instrument from its case, and sure enough, before long, the music starts in the wood-paneled room at the rear of the shop—a spontaneous concert of tuneful strumming, picking, and singing by musicians who’ve pulled chairs close together. More people gather, including a boy who looks nine or 10 years old and is carrying his own mandolin, ready to join in and play. Meanwhile, some of the others who settle in for a while in the mismatched chairs, myself included, are there just to watch. From Drexel we go deeper into a countryside of barns and farms and follow handmade signs to an off-the-GPS homestead in Caldwell County. (A section of the book saved us by providing helpful driving directions.) We ramble down a dirt road and over a rise, and there it is, some 100 cars in a grass and dirt lot beside a large pond and what looks like a long barn of hewn logs. We’ve arrived at Sims Country Bar-B-Que, a family owned restaurant open since 1979. Primary draws are the all-you-can-eat barbecue (a clean chop without much fat), the mixed baked beans, and falling-off-the-bone roast chicken, but this place isn’t only about food. The gift shop in a shack near the front door is filled with wood carvings, handmade furniture, baskets, and prayer boxes. And at the far end of the building, past the massive stone fireplace, is a stage for a square dancing band. The musicians play stand-up bass, guitar, fiddle, mandolin, and banjo, sometimes pulling a harmonica and spoons into the mix too. Teenage girls in clogging shoes click-clack onto the dance floor during some songs, in musical sets rounded out with country standards, waltzes, and live-called square dances. No alcohol is served here, and the all-ages crowd of couples and families departs early into the darkened parking lot, far from any city lights. The next day is a sunny, sleepy Sunday, and we’d planned just one more musical stop at the bright and shiny, newly opened Earl Scruggs Center. Situated on the square in the former Cleveland County Courthouse in the center of Shelby, it’s an impressive place: Many of the exhibits are interactive and high-tech, and a large, glass-topped computer lets you create and play in a picking parlor band with other museumgoers. But my favorite hands-on feature is much simpler. The center shares its collection of new Deering banjos with visitors, allowing anyone to pick one up and give it a strum. I’ve never had a lesson, and it shows when I take my turn. Amen to that, and to trails and hollows so full of music, they never end. More than a decade in the making, Blue Ridge Music Trails is a project of the North Carolina Arts Council and dozens of partner agencies, venues, promoters, and artists in Western North Carolina, including the Blue Ridge National Heritage Area. “We’re trying to make it easy for music fans and visitors to find the music,” says Dale Bartlett, the project’s coordinator. The route has no official starting point or finish line. Instead, the “Trails” are more free form—akin to a never-ending, picking parlor jam session. To find the music, you can start anywhere in the 28 western-most counties that encompass the hundreds of music-related points of interest. Locate traditional, string-based music venues, events, and related sites simply by flipping through the latest edition of the comprehensive Blue Ridge Music Trails of North Carolina, by Fred C. Fussell with Steve Kruger, which also includes a CD of recordings by some of the region’s influential musicians. Or go online to the Trails’ brand new website, www.blueridgemusicnc.com, which allows you to seek out places within a radius of your choosing. The book and website also include the history of songs and places, interviews with musicians, and plenty of photographs, maps, and contact information. Interested in following in writer Sandy Lang’s footsteps along the Blue Ridge Music Trails of the High Country? Here’s a resources list to get you started. You’ll find these and dozens more music-related points of interest in the book Blue Ridge Music Trails of North Carolina by Fred C. Fussell with Steve Kruger, or online at www.blueridgemusicnc.com.